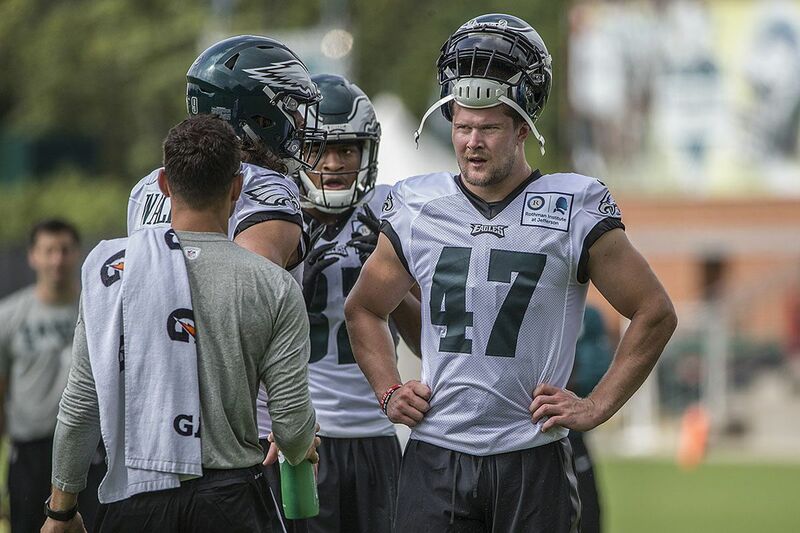 Eagles linebacker Nate Gerry (47) played safety in college at Nebraska. The Eagles' coaching staff saw enough of rookie linebacker Nate Gerry in shorts during the spring. There was little question that Gerry, a converted safety, could move well at his new position. The question was how he would perform when the pads came on and he needed to play physically in the second level of the defense instead of in the secondary, especially on running plays. After two weeks of training camp, two live contact practices, and days before the first preseason game, the early returns are in. And the Eagles are bullish about their fifth-round pick out of Nebraska — so much so that when starter Mychal Kendricks was sidelined with a quadriceps injury, Gerry took first-team snaps next to Jordan Hicks. Do drops mean Eagles will see same old Nelson Agholor, or is he tough enough now to push through? "Very encouraged," defensive coordinator Jim Schwartz said. "He's responded to every challenge we've put in front of him. When we've had some of those live contact practices is when he's showed up the most, and I think there is some 'football player' to him. …You expect him to be good in coverage, but he's played very tough, very physical. You don't get very many live periods in practice, but when it has, he's showed up. He's been assignment sound." Schwartz added that it will be a "big preseason" for Gerry to show his progress. The first game is Thursday against the Green Bay Packers, and look for Gerry to take on a significant workload. Gerry said the game will offer him a chance to show how knowledgeable he is without the coaches on the field. In practice, a player can use the time in between plays as a crutch. The coach is there for input. In games, the next play comes quickly. Gerry likes how detailed the NFL game is, and he's eager to take the emphasis from the film room and apply it to games. The "football player" label that Schwartz offered is a sincere compliment for a linebacker. It suggests that he can make plays on the field, that he has the instincts to find the ball and the toughness when near it. It's especially complimentary for a player who, entering camp, needed to show that he can "[fill] the run inside when the pads come on." "He's physical, and his speed coming from where he's from really stands out and his ability to make plays," Hicks said. "He's doing some exciting things." Gerry has played both weak-side linebacker and strong-side linebacker, so he's able to play both outside spots. The Eagles have not used as a middle linebacker yet. If Kendricks or Nigel Bradham is out at any point this season, Gerry can be the first linebacker into games with a strong summer. That's how wide-open the Eagles' backup linebacker spots are at this point. Although the proliferation of passing offenses in the NFL has made Gerry the latest safety-turned-linebacker, the transition is not as simple as adding size and learning different responsibilities. The entire vantage point on the field is different. Gerry explained how much quicker action happens at linebacker, considering that the ball or the blockers can get to the second level quicker than the defensive backfield. So on running plays when the Eagles want to see Gerry's physicality, there is little time for reading — only reacting. "Playing in the back in college, you have time to see things develop, you have time to diagnose where the run is going to go and it's easier to play off someone compared to when you play linebacker, things happen so quick," Gerry said. So he finds a gap and he tries to plug it. However, he noticed one difference from college to the NFL is the athleticism of the offensive linemen. There are 300-plus linemen in the NFL who move like college tight ends. Gerry said they have quickness from side to side and also downfield. "And if you don't strike them, you're going to get beat," Gerry said. On passing downs, Gerry said the adjustment is where his eyes must go. As a safety, he plays from the top down and can focus on the routes of the receivers and tight end. But at linebacker, he's often the underneath coverage. He doesn't need to pay as much attention to the routes as he does the quarterback. "Pass-coverage wise, to be able to play off the quarterback is a big change for me," Gerry said. Still, his background has made the nickel defense "a little bit easier" than the base defense. The body types on offense also give him an advantage in nickel defense. The Eagles will use that package when there are three receivers, one tight end, and one running back on the field. Gerry, who is listed at 6-foot-2 and 218 pounds, is often bigger than the extra receiver. But if the Eagles are in base defense against a two-tight end or two-back set, he's often smaller than the extra tight end. In addition to Thursday's game being his NFL debut, it's also the closest he'll get all year to his native South Dakota. So his parents, siblings, and other family members will be at Lambeau Field to watch Gerry's first NFL game. It will come at linebacker — not safety, where they last saw him play. And if the Eagles' optimism is merited, Gerry could carve a role at that spot.